Everyone is excited for Heart’s Day which usually comes with gifts, stuffed toys and Valentine’s Day cards. Malls and gifts stores will surely be jammed with people all hankering to get the perfect gift for their loved ones. Why not do away with the crowd and long queues on counters by merely printing and making your own cards? For sure, you would want to see your cards on your loved one’s special collections even if the boxes of chocolates are gone and the bouquet of roses are trashed. 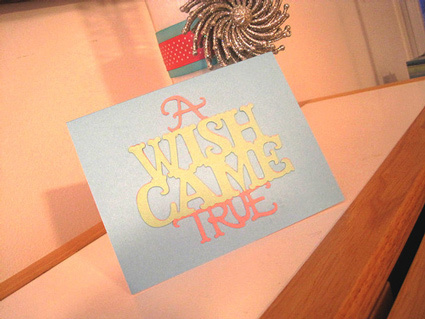 Make a custom personalized card that is totally unforgettable and truly worth keeping. Here’s a collection that will make you fall in love,33 Totally Heart Grasping Valentine’s Day Cards which will inspire you, motivate you and will give you great ideas on making your own cards. Your card recipients will surely look forward to receive a card from you for Heart’s Day every year ‘coz they are really worth keeping. Enjoy looking at the collection and may you have a great Valentine’s Day! 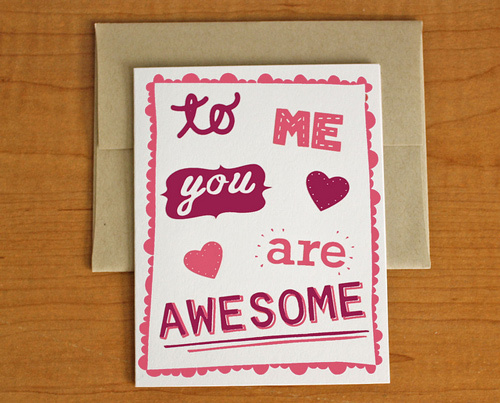 Your girlfriend will surely be pleased if you give her this card full of flattering modifiers. 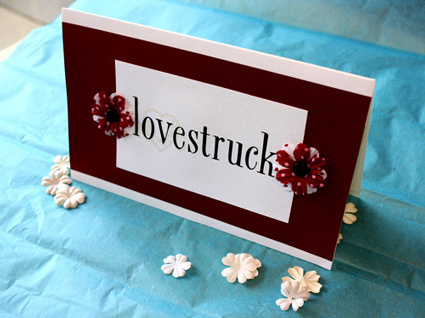 A simple card with the contrast of white and red giving emphasis to the words “lovestruck”. The pretty red and white flowers gave this a feminine touch. 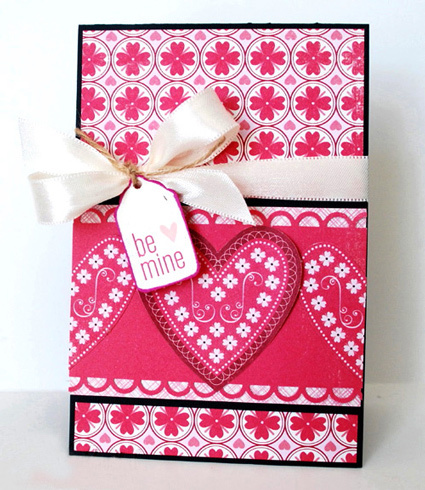 See a collection of handmade cards made of felt hearts, gems and stencil designs which you might want to try. Blue hearts or pink hearts? Whatever you choose will still make this card look great. 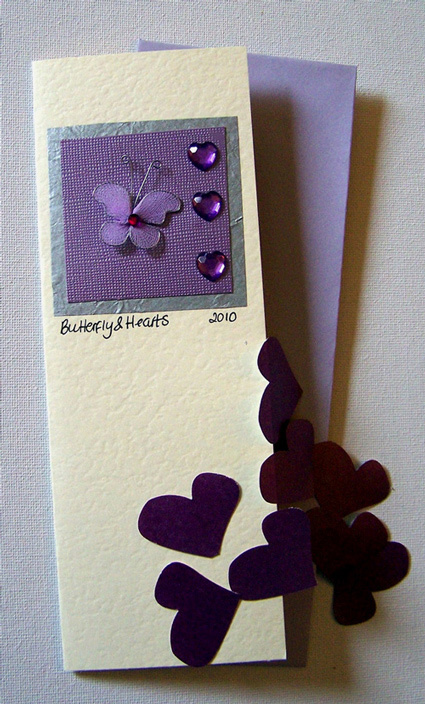 A lavender card is indeed unique especially with its butterfly embellishment. 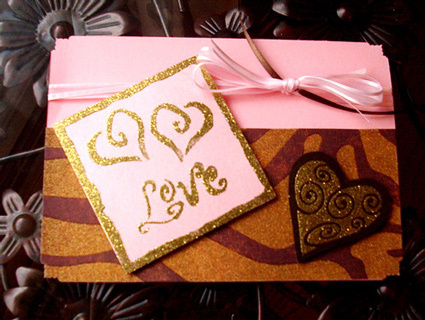 Sweet nectars for a beautiful ruby butterfly and a pretty gold stencilled card for a sweet Valentine. 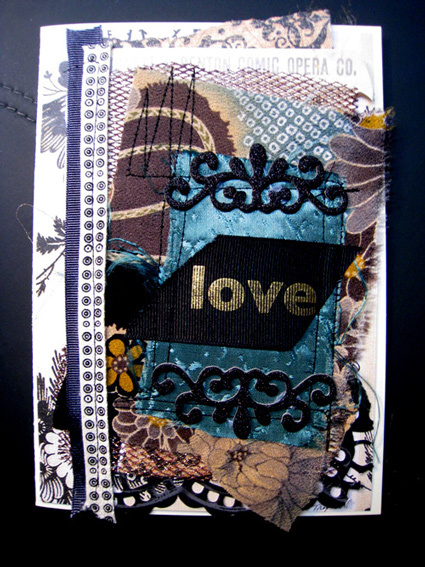 Another set of cards made from scrap cloth of various designs placed layer by layer. Totally creative isn’t it? 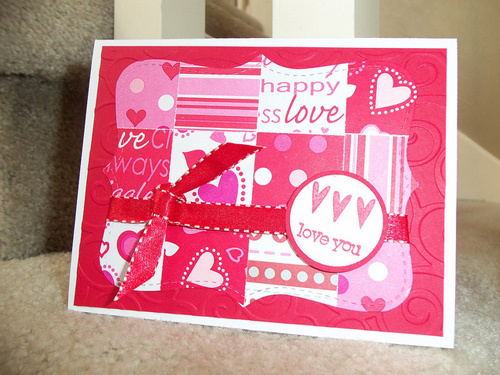 You can try making cards like this one. 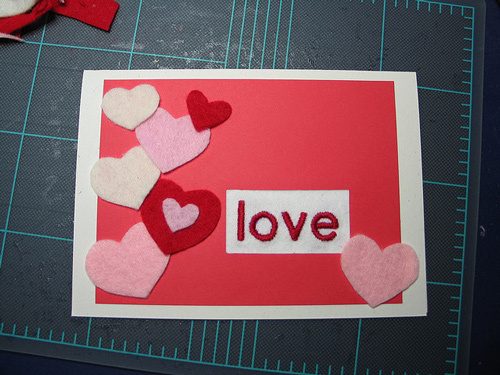 Instead of dumping cloth scraps in your garbage bins, use it in making adoring cards for Valentine. 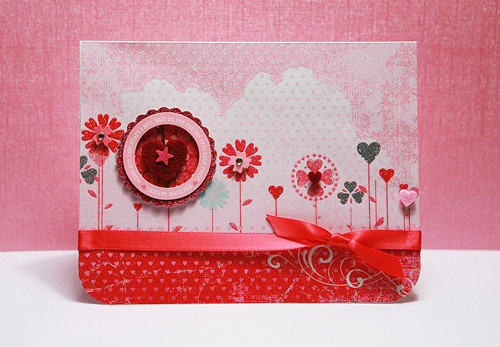 Polka dots and a red heart gives this card a truly girly aura. A touch of nature with its leaf borders and earth tones. 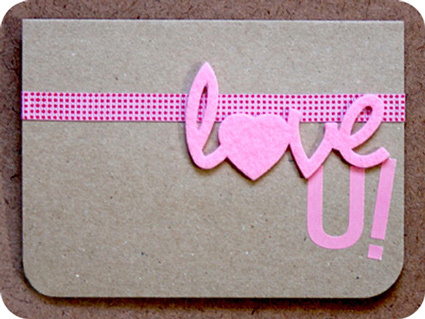 Compared to other Renee Troy designs, this is simpler giving emphasis to a big pink heart saying I Heart You! 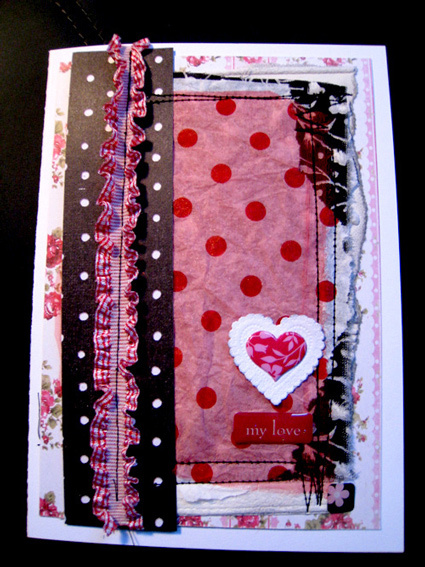 A complicated design with layers of cloth showing enough love to your Valentine. 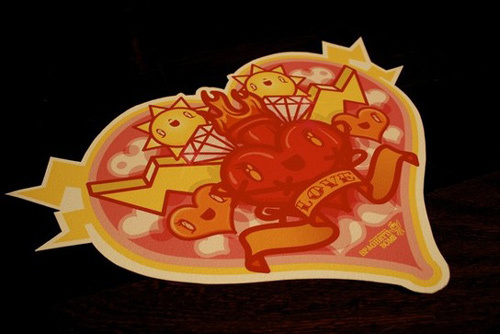 Indeed you are love struck by love’s lightning bolt in this unique handmade card which its minimal design. For those who are head over heels in love and are greatly obsessed with the person they fancy, this card is for you. You are smitten! Go as red as love and lovers for Valentine’s Day! It doesn’t have to be very fancy. It may just be as simple and as elegant as this. 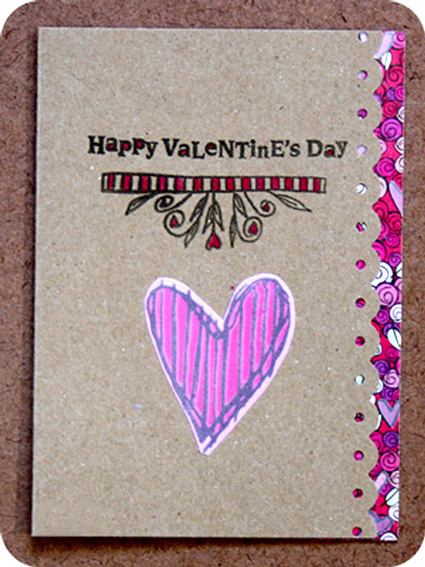 This card would remind us of yummy chocolate and pink roses. 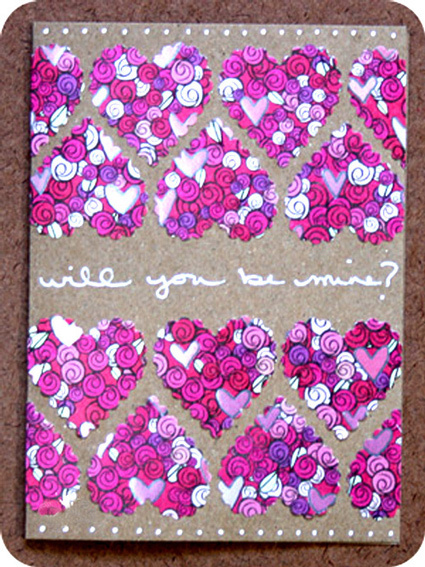 So you don’t have to spend for chocolates and roses, all you need is this pretty card. One look at this card and you’ll get the message in an instant. 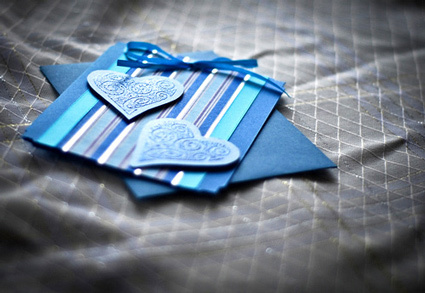 A blue Valentine card with two perfect blue hearts but this card doesn’t mean that you’ll feel blue on Heart’s Day. 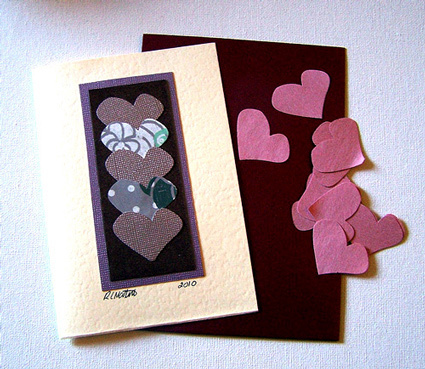 This only shows that one can actually make a Valentine card with a different hue other than the traditional Valentine colors of pink, red and white. 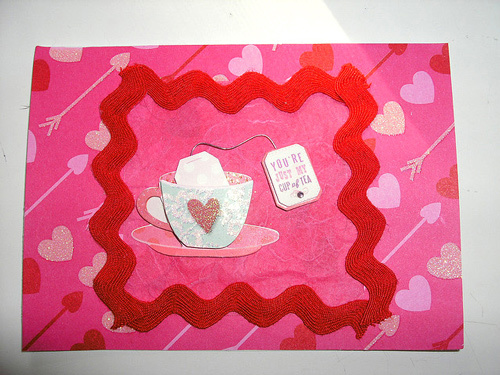 If giving love is like a cup of tea for you which means that you do that everyday, this card suits you. Simple but expresses the love much. This one’s for you if you love the simplicity and a little bits of hearts. Why not put some thrill on the cards that you will give? 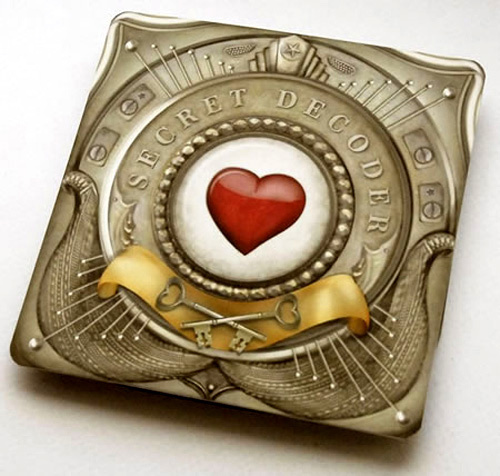 Here is a Secret Decoder Valentine Card wherein the recipient has to figure out what you are trying to say. Absolutely exciting! One look at it and you’ll say its crafty. 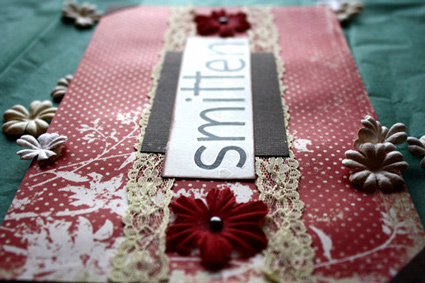 A personalized card using patterned paper, felt borders and stamps. 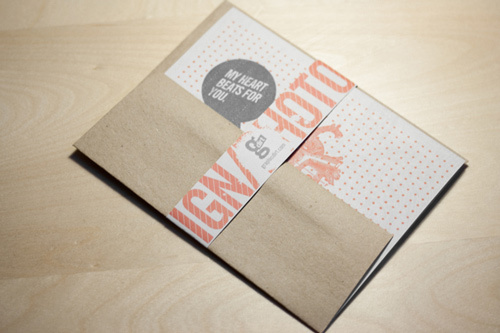 Put a personal touch on your cards and for sure your Valentine will receive the message right. 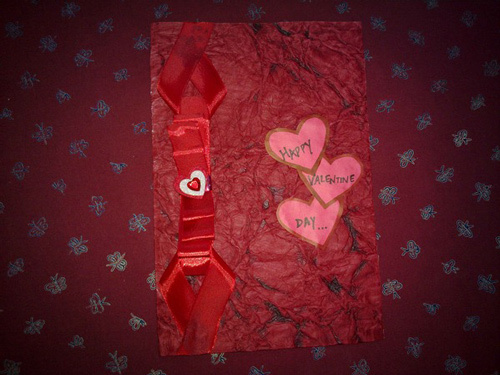 A handmade valentine card is as good when you have expressed what you feel. Feel the love from your own masterpiece. 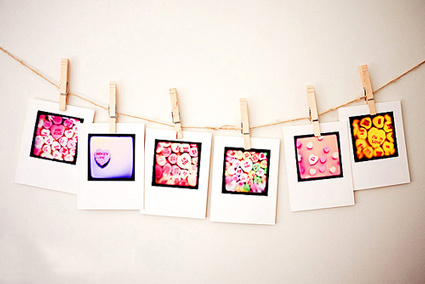 These cute Valentine cards with original photographs may look small but would give a bunch of joy to your Valentine! 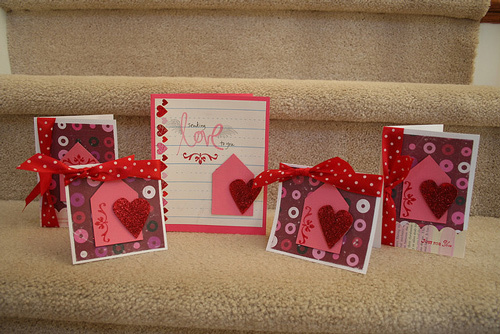 If you want a simple card which you can easily make from what you have at home, you may try these cards. This looks simple but when you scribble you emotions inside, this will surely turn this cards into something grandeur! 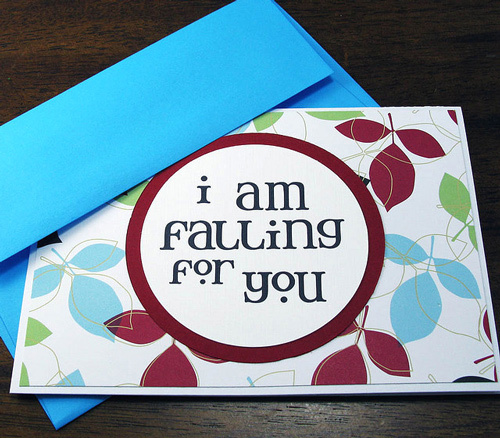 A subtle card with simple words expressing one’s genuine emotion. 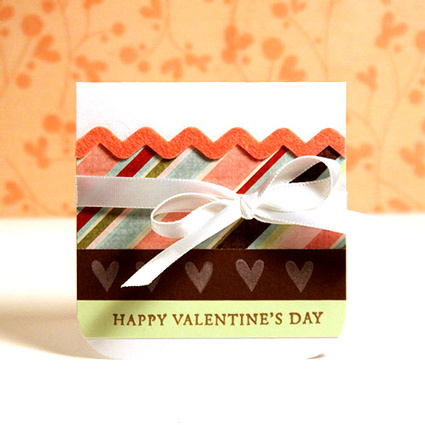 Printed wrapper arranged in pleats gives this card a unique touch. 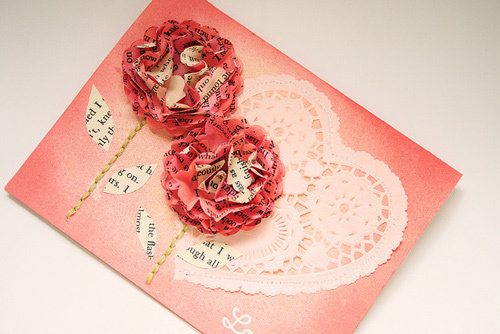 Instead of throwing scrap wrappers, cut it into hearts and arrange it in a way that it could frame a handwritten message that comes straight from the heart. 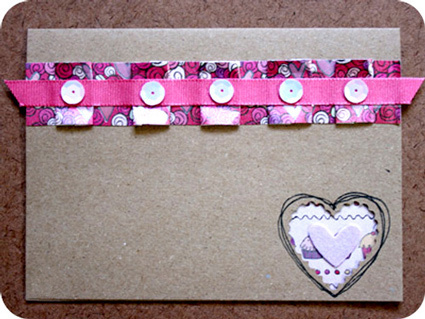 Write down that greetings and place a delicately designed paper as your border. This makes your card look simple yet sophisticated. 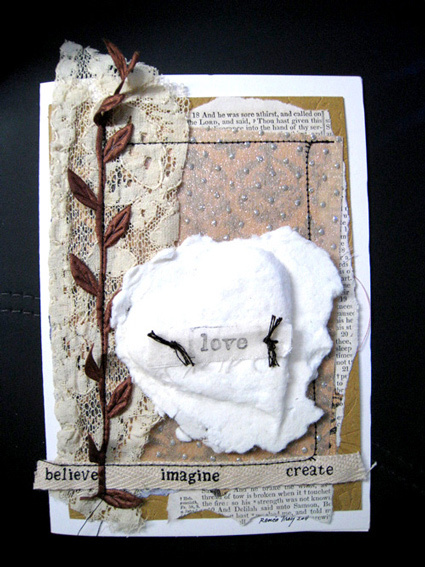 Another set of handmade cards to inspire you to make your own and flaunt your style! 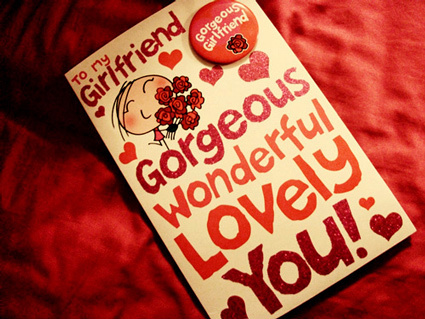 Of course you are lucky if you find your true love but your only love will indeed be lucky to receive a pretty card like this. Pretty and amazing for a valentine’s card. Another expression of love. This beautiful card with its combination of violet,blue and green makes it truly unique and worthy for that Valentine. A few hearts will be as good as deciding to add some other details like this. Something new and not as fancy will do. A collection of unique, artistic and totally awesome Valentine’s Day cards that will make you burrow through your art materials or creatively work on Photoshop. 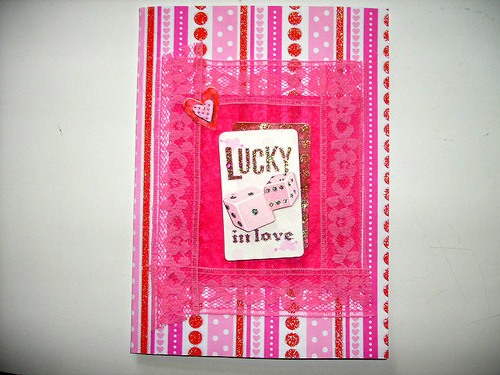 Why don’t you trying making your cards now and impress your friends and special someone? 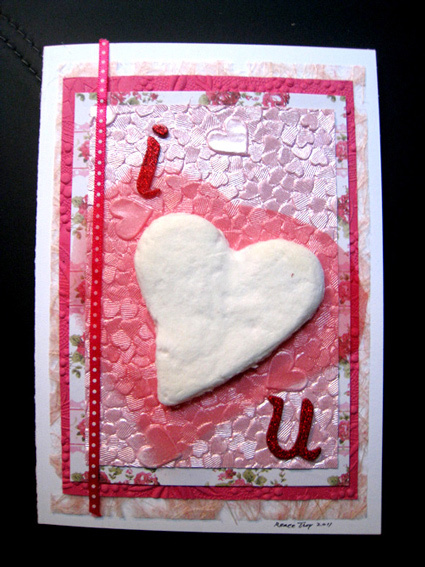 In the event that you don’t hit the malls + giftstores AND you don’t get around to making your own amazing DIY paper card, you’re always welcome to come and make your own creative ecards (with your own images, flickr photos, and youtube videos) free on http://cardkarma.com. Have a wonderful Valentine’s Day and thanks for sharing! Did you notice that little bug on you share bar? those cards are nice. 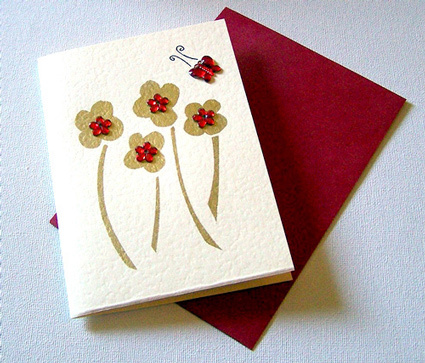 In indonesia, handmade cards can be found easily.